When you watch Vaaranam Aayiram, a little kid will attract your attention for his cuteness and tremendous performance for his age. His role in the film is small, but the impact will linger on! He is barely 6-1/2 years old yet he was the “director’s actor” on the sets of Vaaranam Aayiram just like Suriya! Meet Master Adithya Kurup, son of Gautham Kurup (line producer for Vaaranam Aayiram). He is cute, talented, and energetic. He has no fear of the camera and has great discerning capacity – boy, he will go places for sure! Watch Vaaranam Aayiram and you will understand what we are talking about. When Gautham Menon wanted a young kid to act in Vaaranam Aayiram, he did not have to look further. His attention fell on his line producer Gautham Kurup’s vivacious son and Adithya bagged his first film role! Well, the last line in this little star’s message is a fitting tribute to the spirit of Vaaranam Aayiram – a film about relationships with emphasis on the father-son relationship. You know what?! Adithya has become a diehard Suriya fan after working with him! Just a mention of his name lights up this young man's face with joy! He is looking forward to meet his Suriya uncle to celebrate the grand success of Vaarnam Aayiram! V. Jayaraman and Gautham Kurup own Exotique Productions, the end-to-end solution provider for filmmakers. 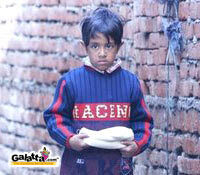 Galatta.com wishes this youngster a bright future.